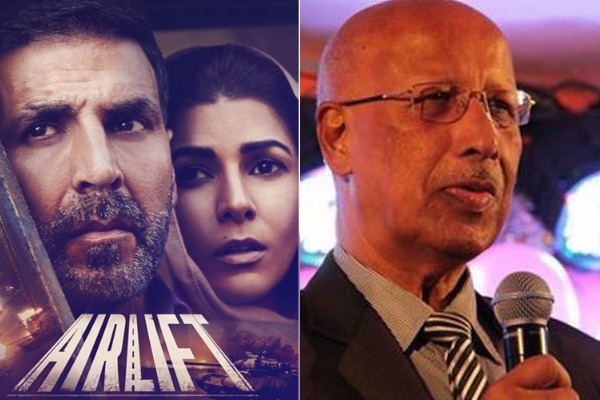 Akshay Kumar, Nimrat Kaur’s starred ‘Airlift’ movie was inspired from NRI businessman Matthunny Mathews real life incident. Akshay Kumar who played the role of Ranjit Katyal, was the real life character of Kuwait based Matthunny Mathews. The super hit movie was based on the real event of largest evacuation done by Air India in Kuwait, which was possible due to Matthunny Matthews. Kuwait based Matthunny Matthews was the person who inspired movie Airlift and the real brave-heart hero who saved the lives of 170000 Indians who were stranded in the invasion of Kuwait by Iraq back in the year 1990. This was the biggest human evacuation in the history which also entered Guinness Book of World Records. The brave hero passes away in Kuwait at the age of 81 and left for heavenly abode yesterday after a prolonged disease. Bollywood actor Akshay Kumar mourns the demise. He took to his twitter handle and expressed his grief saying. “Extremely sad news, was an honour to portray him onscreen. Thoughts and prayers with his family #RIPSunnyMathew“. “He provided food and drinking water to the stranded Indians and we remember it with gratitude,” Vijayan added. Matthunny Mathews was also known as Toyota Sunny after he started his career in Kuwait with Toyota agency as a typist and rose to become its Managing Director. Sunny Mathews comes from Kumbanad village, Kerala, who flew to Kuwait in 1956 and settled their with his family. Next : Sonam Kapoor at Cannes 2017: Sonam Goes Radiant Like A Gold Rose In Elie Saab!